1 heat oven to 400 degrees. Spray round nonstick baking pan, 8 x 1 1/2 inches or 9 x 1 1/2 inches, with cooking spray. Heat pan in oven. 2 beat flour, sugar, salt, milk, and eggs with a hand beater until smooth. Poor into hot pan. 3 bake 15 to 20 minutes or until puffed and browned on edges. 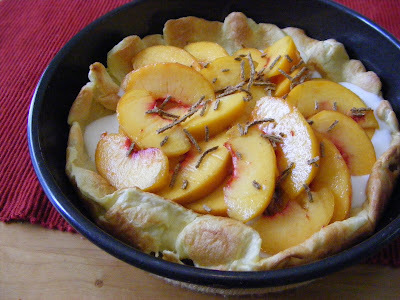 Immediately spoon yogurt and peaches into sunken pancake center. Sprinkle with cereal. Serve warm. Oh my, that must be tasty. What an usual but delicious looking recipe for peaches!